Taxon of the Day looks at one of the largest members of the Liliaceae family. Cardiocrinum giganteum (Wall.) 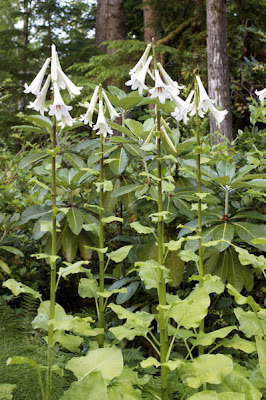 Makino or Giant Himalayan Lily is native to the Himalayas and one of three species in the Genus Cardiocrinum all found in the Catalogue of Life. It has two known varieties Cardiocrinum giganteum var. giganteum found in the Himalayan regions of Bhutan, Myanmar, India and Nepal, and Cardiocrinum giganteum var. yunnanense native to southeast China. The other two species are distributed in eastern China (C.cathayanum) and Japan (C.cordatum) respectively. Cardiocrinum giganteum is a bulbous perennial growing to over 2m in height, with heart-shaped leaves and trumpet-shaped, white flowers with purple markings inside. Cardiocrinum giganteum has been widely introduced as an ornamental garden plant in temperate areas, becoming naturalised and potentially invasive in certain areas of western New Zealand who have noted it as a 'weed of invasion stage-2' (Phartyal et al, 2012). Invasive species have a major impact on the environment, threatening biodiversity and reducing overall species abundance. Whilst the Catalogue of Life covers some 70% of the world’s known species, and is growing steadily in quality and coverage, we are still without a complete, comprehensive and global list of the Earth’s living species against which to measure biodiversity change. A nice blog and by coincidence I saw and photographed the rather less common Cardiocrinum cathayanum yesterday while on fieldwork yesterday. It's a shorter species with deep red staining inside the petal tube. Alastair, I'm very interested in where you photographed. C. cathayanum. 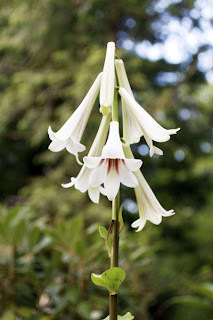 I hold the UK National Collection of Cardiocrinum and am working on a refinement of the taxonomy of the genus and would greatly appreciate more information on C.cathayanum.